At 337 and 280 meters, the towers are envisioned as stacks of blocks, many of them sporting interactive media façades, and together containing retail offices, two cinemas and two hotels, all built atop the city’s existing Main Station. Down below, the bases of the buildings will create a retail area for pedestrians, while the higher blocks are intended to house the remainder of the towers’ offerings. Of the two planned hotels, one, set to crown the East tower, will cater to young, trendy travellers, while that in West tower will appeal to luxury guests. At ground level, a sunken plaza will serve as a sort of archaeological study, with structures marking the former locations of the original station, a plaza and old houses, while providing shade and hosting public events and other services. Escalators and walkways will connect terraces atop the retail blocks, and an elevated walkway will connect the station with surrounding destinations. Perhaps the towers’ most impressive feature, however, is their view from above. 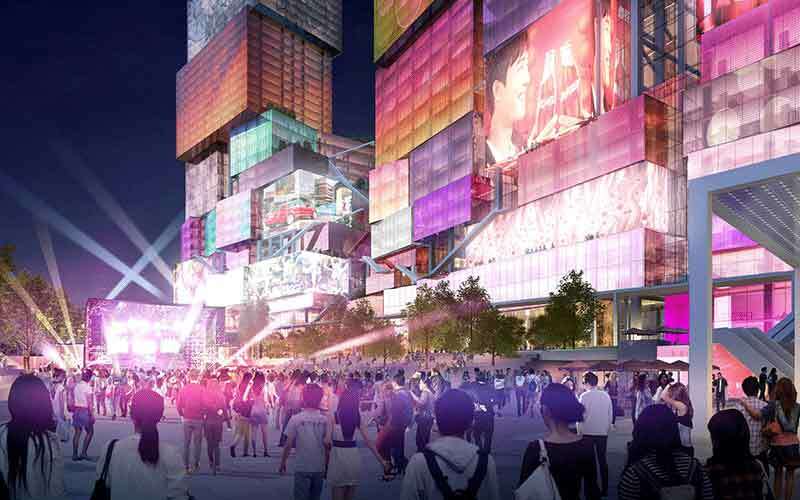 Standing high above the buildings surrounding them, the towers are designed to feature illuminated, interactive media displays, allowing them to serve as screens for cultural spectacles, sporting events and advertising.